Its tidal phenomenon has been wowing visitors from around the globe for ages. And it happens here, twice a day, every day in Nova Scotia’s Bay of Fundy. 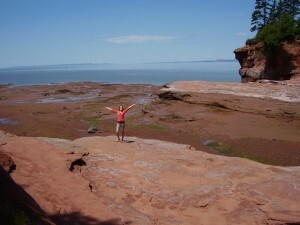 The Bay of Fundy is a world-renowned legend out here on Canada’s fabled east coast. The natural conical shape of the bay has created something truly amazing. The tides here rise and fall higher than anywhere else in the world. Tides higher than most small buildings. And what’s even more amazing is that there are two opportunities to see this unbelievable show each day! The tide schedule follows the lunar calendar and twice each day millions of tons of water flood in and out of the bay. 1. The average time between high and low tide is 6 hours and 13 minutes. 2. In one tide cycle, 160 billion tonnes of seawater flows in and out of the Bay. That’s more than the combined flow of the world’s freshwater rivers! 3. The local ecosystem’s biodiversity is comparable to the Amazon Rainforest! You’ll find more than 12 species of whales in the Bay, as well as dolphins, porpoises, seals, seabirds and more. All are drawn to Fundy’s nutrient rich waters. 4. The height of the tide ranges from 3.5 meters (11ft) along the southwest shore of Nova Scotia and steadily increases to the head of the Bay where it can reach an incredible 16 meters (53ft)! 5. Burntcoat Head Park located in East Hants, has the greatest mean spring tidal range and provides some of the best places to view and experience the Bay of Fundy.